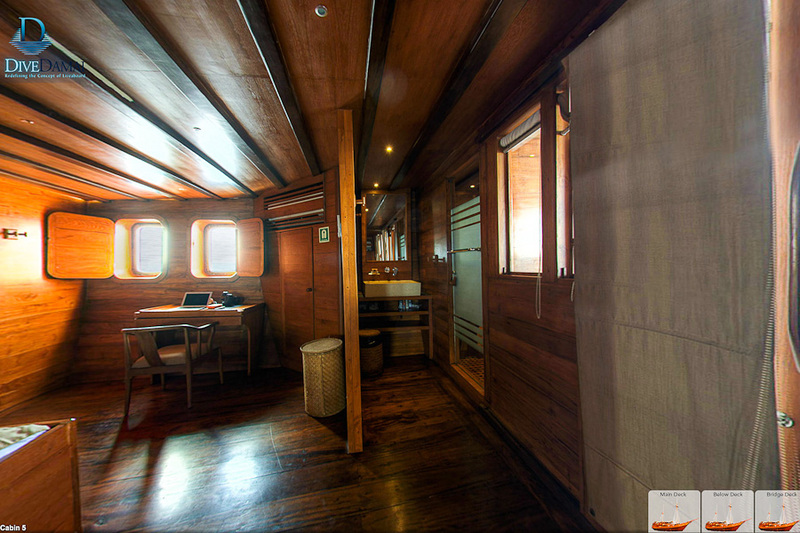 Damai 2 liveaboard - Indonesian luxury liveaboard diving - Book now ! Damai II has a deck length of 40 meters and a beam of 9 meters at its widest point. It has been built to an uncompromising standard and fitted out with all the latest diving, navigation and safety equipment to ensure that the level of service appreciated on our first vessel is maintained and, where possible, improved upon. The vessel has three large outside deck areas with an outside dining facility, massage and spa treatment area and plenty of extra lounging and sunbathing space. 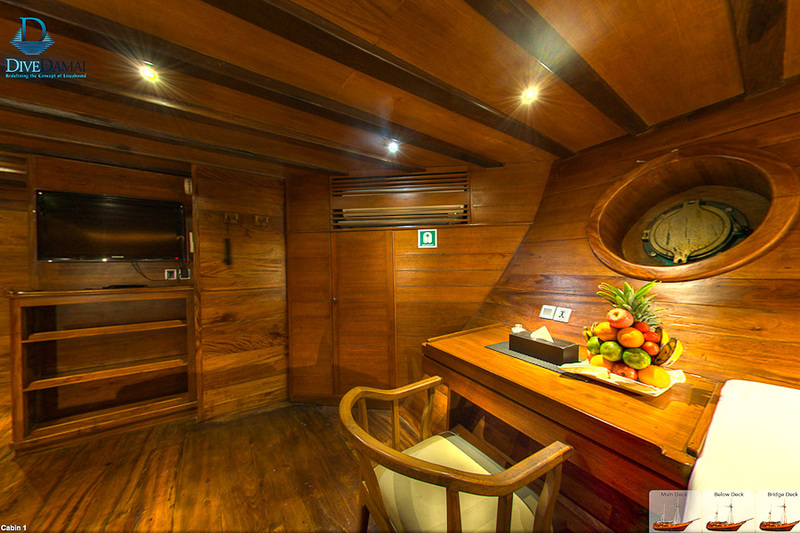 The below deck accommodation has been designed to accommodate single or twin occupants in a level of luxury not seen on another vessel in Indonesia. 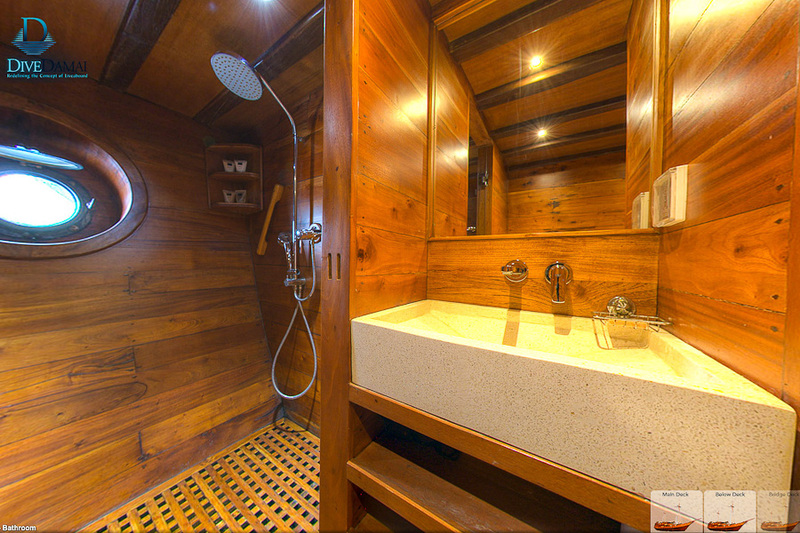 Each cabin boasts a private shower and head with a queen-size bed and a separate day bed. 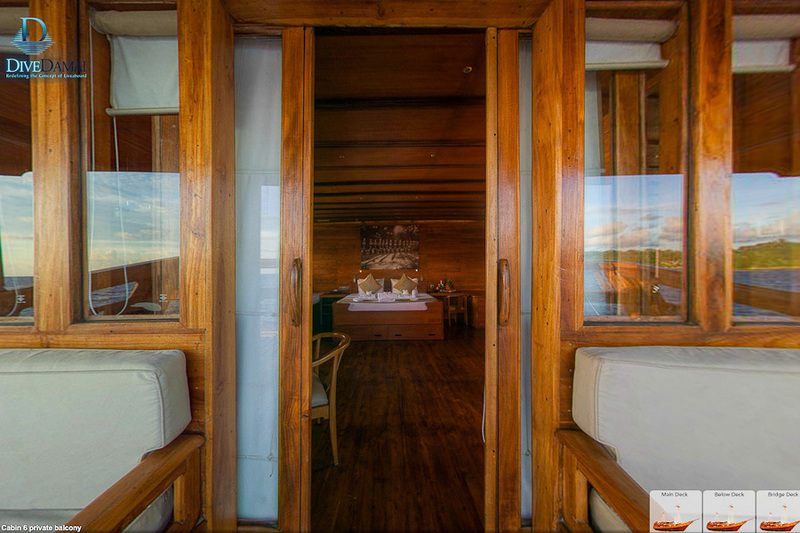 The cabins measure approximately 20sq.mts (225 sq.ft) each and have been finished with the highest quality furnishings. 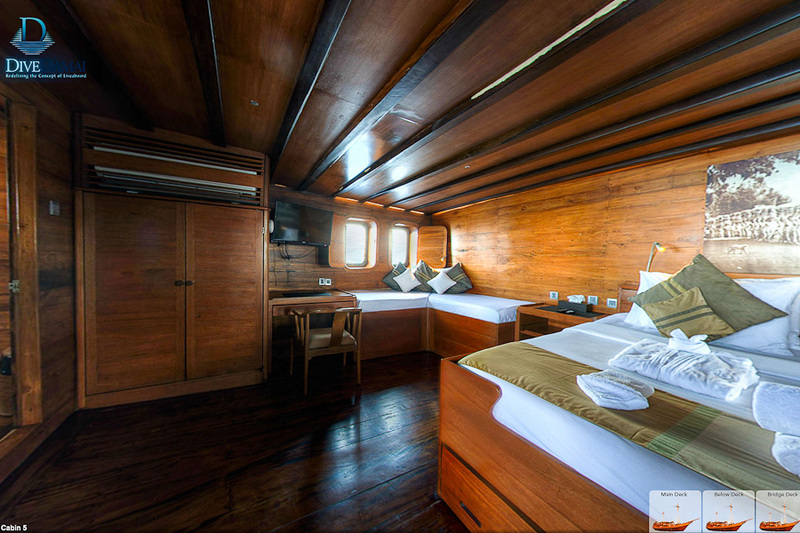 The stern staterooms are over 400 sq.ft each and boast their own private deck with loungers, a super-king size bed, day beds, two desks and ensuite shower and separate head. The dive station is served by large individuals rinse tanks. The camera room is large also. The 4 diver to 1 guide ratio that our customers enjoy so much has, of course, been maintained and we have added 2 custom designed high speed tender boats. 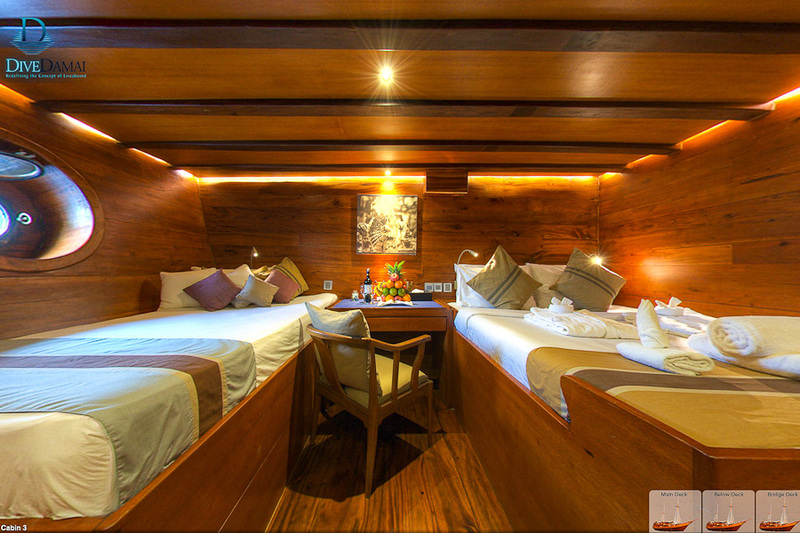 Each boat has two double cabins that could be used as SINGLE CABIN for an additional US$175 per night. 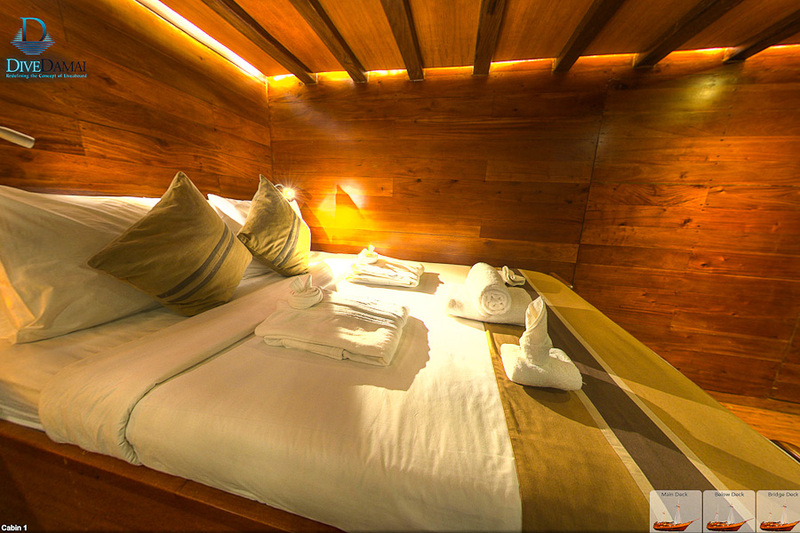 Dive Damai offers 5% discount for group of 4 -7 guests. 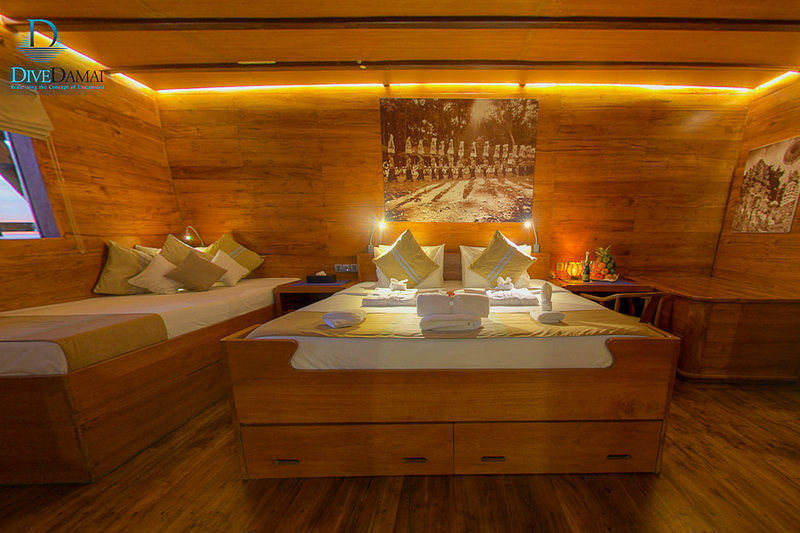 A group of 8 paying guests will receive 1 space free of charge at a deluxe cabin rate. Full boat charter is 10 paying guests + 2 guests free of charge. Chartering one of our boat will give you the chance to select the route you prefer to do, we will tailor make the trip. The advantages are multiple and among them we could mention the chance to stay as long as you want in one spot without having to be worried about the preferences of the rest of the customers. Being able to spend your diving holidays with your friends, with the whole crew dedicated entirely to you is very tempting, astherearethe rates we offer when you select this option…you are the real master and comander! Please note that you must have a minimum of 6 months left on your passport and one full clean page for your visa on arrival. *The Boat encourages guests to book all inclusive package to include full equipment & Nitrox at a very special price. Please contact us for details or if you wish to add equipment during your trip. *Free Nitrox and complementary dive equipment will be offered for all repeat customers. 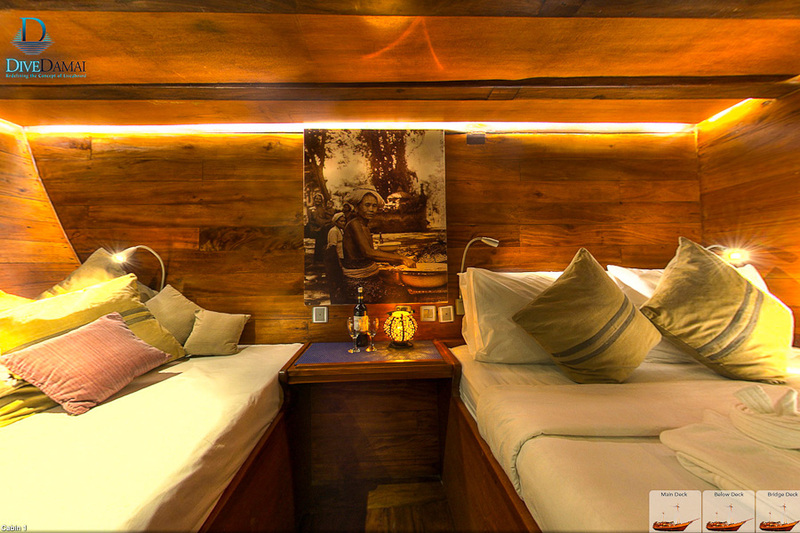 The below deck accommodation has been designed to accommodate single or twin occupants in a level of luxury not seen on another vessel in Indonesia. Four cabins below deck are 20 – 25 sq metres. Each has a double bed / queen bed (160 x 200) and a small day bed, a desk and a wardrobe, reading lights and a bed side table. They are fully air-conditioned and equipped with flat screen TV within a centralized entertainment system and of course en-suite facilities. Cabin #5 below deck is 40 sq metres. 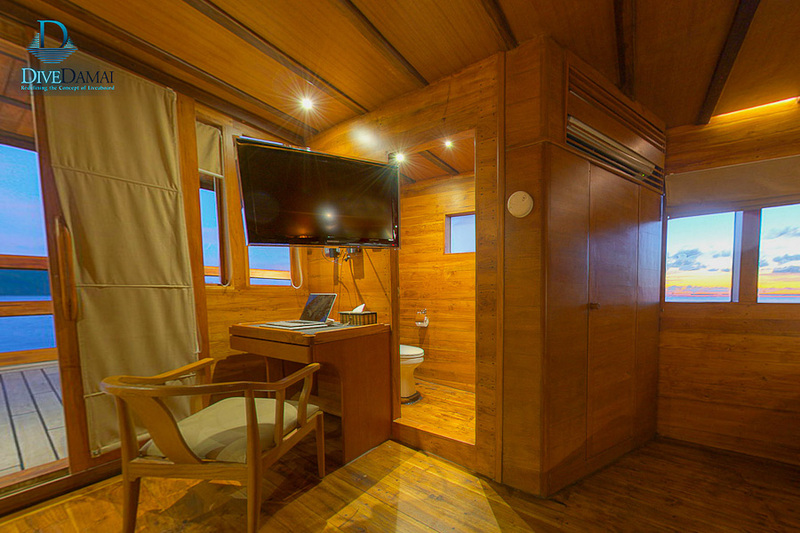 It has king size bed (200x200) and a narrow day bed, 2 desks, private balcony and inside the cabin, two compartments room for shower and toilette, reading lights and two bed side tables. It is fully air-conditioned and equipped with flat screen TV within a centralized entertainment system and of course en-suite facilities. 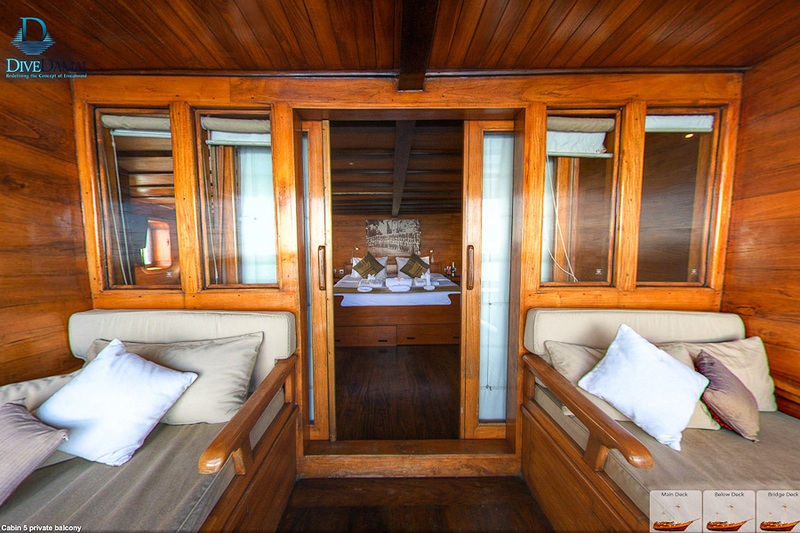 Cabin #6 is located on the main deck. It is 40 sq. metres in size and has a king size bed (200x200) and a day bed (100x200), 2 desks, private balcony and 2 ensuite compartments for shower and toilet, reading lights and two bed side tables. 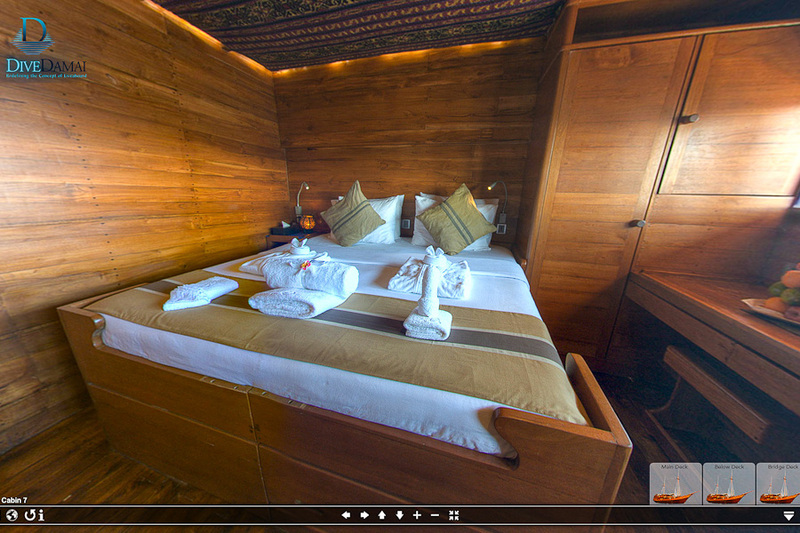 It is fully air-conditioned and equipped with flat screen TV within a centralized entertainment system. Cabin #7 is located on the bridge deck. It is 18 sq. 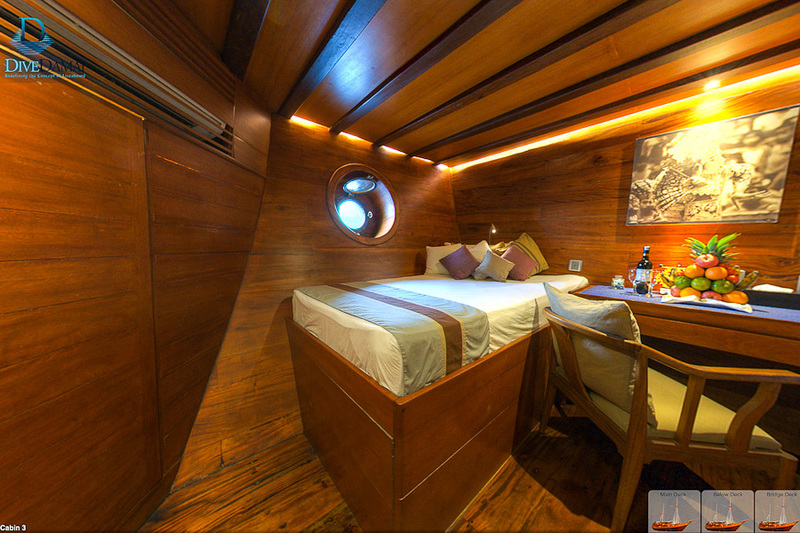 metres and has a double or twin bed (200x200), a desk, direct access to the sun decks, reading lights and bed side tables. It is fully air-conditioned and equipped with flat screen TV within a centralized entertainment system and of course en-suite facilities. Diving in Raja Ampat is breathtaking, with the marine life thriving from the sea floor to the surface and the colourful reef teeming with activity. There are sites that are so pristine and packed with growth, that a photographer is hard-pressed to find a spot to place a steadying finger. Exotic sea life and macro critters abound of course, and photo opportunities border on overwhelming. Raja Ampat liveaboard trips offer divers the opportunity to explore the entire region. You have the colourful soft coral areas around the southern islands of Misool with the opportunity to see sharks and mobula rays. In the north you have the world famous current rich Dampier Straits with iconic dive sites like Cape Kri and Blue Magic. In the east you can visit pristine coral gardens and climb to the viewpoint above the lagoon at Penemu. In the north you can dive with mantas at Kawe and go critter hunting in Aljui Bay. Luxury liveaboard diving on Damai I or Damai II offers charters out of Sorong and gives you the opportunity to explore this extensive area in comfort. You can combine this excellent itinerary with other destinations like Triton Bay and Cenderawasih Bay to complete the Papuan diving experience. Diving in the Komodo National Park is an amazing experience . The abundance and variery of large and small animals, reef creatures and pelagics, invertebrates and vertebrates, shallow reefs, drop-offs and drift dives produces exceptional diving, widely regarded as some of the best in the world. ‘The idea of comparing dive destinations has always made us uncomfortable. But we are very comfortable saying that Komodo will provide you with some of the most memorable diving you will ever do. You will love the place!’ Burt Jones and Maurine Shimlock. Komodo liveaboard trips offers divers the chance to visit all the iconic dive sites like Batu Bolong and Castle Rock as well as a chance to enjoy some lesser known beauties in both the north and the south of the area. Damai I and Damai II liveaboards offer dates throughout the year and the charters leave from both Bima, Sumbawa and Labuanbajo, Flores to ensure you experience this amazing destination in depth. Damai can also combine this itinerary with diving in Bali and Alor. Diving in the Banda Sea offers some of the most unique diving adventures to be found in Indonesia. Located between the much publicized Raja Ampat islands to the north and the venerable Komodo islands to the south, this exciting outpost has distinct volcanic islands and sea mounts which rise from the depths offering superb wall diving and boundless marine life. Banda Sea liveaboard trips visit the historically significant island of Banda Neira, once the center of the Dutch/Portuguese Spice Trade dating back to the early 1600s, now a virtually inaccessible outpost of Indonesia offering amazing macro subjects and encounters with the rare mandarin fish demonstrating their lively mating rituals. A jewel in the crown of the Banda Sea lies further south at Pulau Manuk where seas are populated by hundreds of seasnakes. Dive Nusa Laut for both an example of healthy coral reef and a chance to see hammerhead sharks. Damai I and Damai II liveaboards offer multiple dates departing out of Ambon to visit these pristine reefs and cruise in luxury on seas of indescribable beauty and biodiversity. We also combine dives in the Banda Sea in our Forgotten Islands, Alor and Raja Ampat itineraries. Diving in Cenderawasih Bay National Marine Park allows you to experience one of Indonesia’s newest and most exciting diving destinations and DAMAI is one of the most experienced operators in this area. In fact one of the original survey trips was undertaken from the decks of Damai I and our staff have many months working in this challenging and remote location. Cenderawasih Bay liveaboard trips offer diver the unique opportunity of spending hours diving with multiple Whale Sharks and we regularly see the sub-adults around the local fishing platforms in only a few meters of water. However the area also boasts an incredibly rich history from the many battles between Allied and Japanese forces in the area during WWII and the area is littered with diveable wrecks of aircraft and ships. Finally there are the unique biological aspects of the bay. Geologically the area has been isolated for many millions of years and as a result many unique and endemic species have developed. Fish and creature watchers will be delighted by many species that they will have never seen before. Damai I liveaboard offers a short season of trips out of Biak which concentrate in the inner and outer bay or combine dives in Cenderawasih in Raja Ampat itineraries.